It's Tuuuuuesday! And time to share some of your amazeballs DIY projects rounded up from your submissions over the last week. I was absolutely blown away by Kelly's submission of her little girl's playroom makeover. She and her husband smartly transformed an unused dining room space into an open family-friendly playroom! Your socks are gonna be knocked off, I promise. I'm totally digging this spray-painted "peace" globe by Deepest Ocean Blue. Tracie repainted her prefinished hardwood floors white and basically got a custom flooring look for only $106! 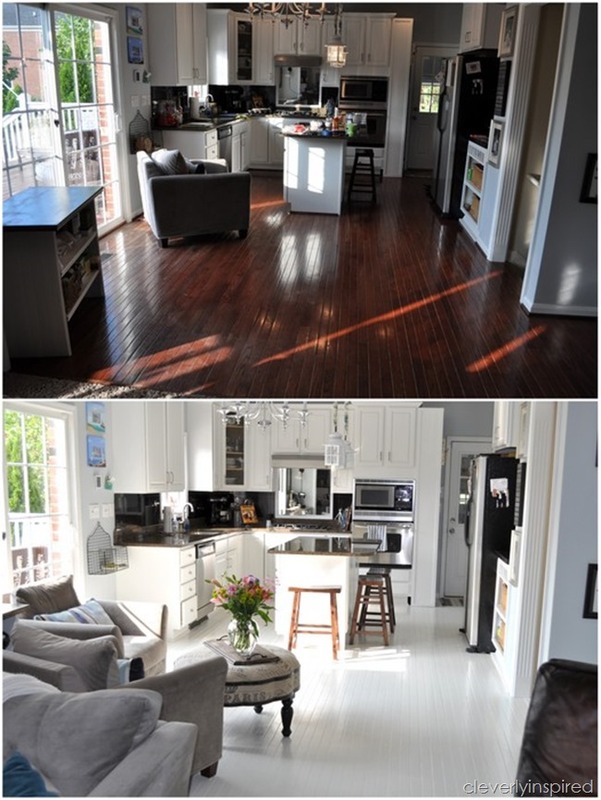 Check out this awesome before/after view of her kitchen. Hopefully I can woman up and get some sewing done before baby #2 comes! (It boggles my mind that I did so much sewing and so many DIY baby items before H was born!) If so, I am totally copying this DIY baby snuggler tutorial by Davenport DIY. How precious! Don't forget, if you've got a recent room makeover or update, DIY project, recipe, kids project or anything else you think I'll love, send it my way! Email me at tenjuneblog@gmail.com (please put "Tuesdays at Ten June" in the subject line) or Instagram your photo for everyone to see with the hashtag #tuesdaysattenjune. That playroom is to die for!! So pretty! LOVE that playroom- ooh la la. Thanks for featuring my globe! That playroom is amazing! And those floors! Gorgeous! WOW! all of these are mind blowing! That playroom is simply stunning! Here in New England most homes have formal living rooms (parlors) in addition to family rooms, both on the same floor. Turning one into an exclusive playroom like this would be a much better use of space. What an adorable room! So functional yet so pretty still! wow wow wow -- that playroom and those floors!!!??? Amazing! I want to be a kid again...that playroom is darling. And those white floors, gorgeous. It's darling, wow I want to play in there!